OroCRM application supports integration with Microsoft Exchange server. 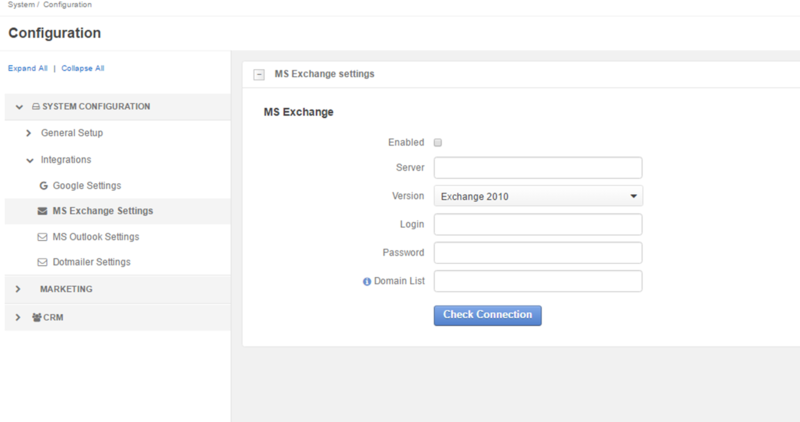 This means that emails from mailboxes on the MS Exchange server can be automatically uploaded to your Oro application. Your MS Exchange Server version is 2007 or newer. The administrator of the Microsoft Exchange Server account has created at least one user with the permission to impersonate the necessary accounts on the related Exchange Server (super-user). The impersonation procedure may be different depending on the MS Exchange version you use. More information on this is described in detail in the Microsoft API and Reference Catalog and the Configure Impersonation article. Navigate to System > Configuration > System Configuration > Integrations > MS Exchange. Login and Password Enter the credentials of the super-user. Domain List Define the domains, to which you will grant access. At least one domain must be defined.